ABUNDANT QUANTITY: 7 sets of colored flag tabs, a total of 1480 pieces, ample quantity and long-term use. It contains 2 set of 1.76*0.98in, 1 set of 1.64*0.47in, 1 set of 1.72*0.98in, 1 set of 1.72in *0.47in,1 set of 1.72in*0.47in with 1.64in*0.47in,1 set of 1.76in*0.31in. MULTIPLE COLOR: Our colored sticky notes have bright color, including rose red, orange, yellow, green, blue, light purple and deep purple. There are 20 pieces and 7 sets of each color, a total of 1480 pieces. In addition, our sticky notes come in different sizes and shapes to suit your needs in different situations. WIDE APPLICATION: This writable labels is suitable for students, teachers, office workers, etc. Ideal for reading, notes, books, magazines, folders, organizers, diaries, directories, archives, file tags and highlights. 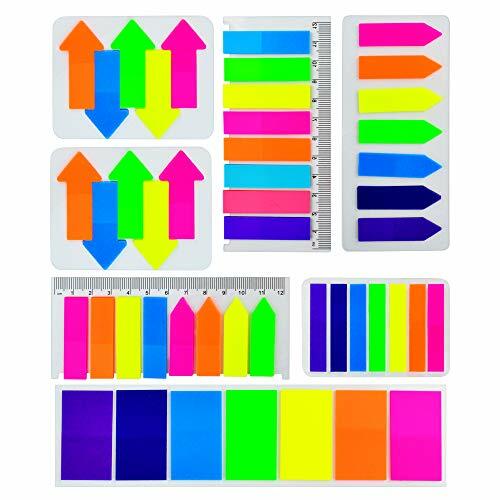 You can mark some important and special information with these bright color page markers. WRITABLE and TRANSLUCENT: Our flag tabs are made with half of the adhesive, rather than the entire adhesive, making it easy to remove and reposition. With a translucent design, you never hide what you need to mark and any information that is easy to write. REMOVE FREELY: The index label made of high-quality PET material is not only non-toxic and odor-free, but also easy to use. Made with removable adhesive for easy repositioning, you can remove them without tearing the paper or page. And can write, recommend ballpoint pen and liquid ballpoint pen.